Great for camping and taking to the beach, this hammock chair is weather resistant and includes a foot rest and a drink holder. Stand not included. 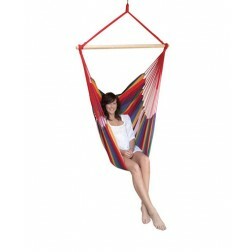 Doze away on this Canvas Hammock Chair with Armrest & Footrest available from Buy Hammocks Online. Crafted to the highest quality, the materials are weather resistant, beautifully designed and durable. Attach this hammock chair to a sturdy beam, tree or one of our chair stands. We recommend combining this purchase with our hammock spring accessories available online to prolong the life of the hammock. * Note: This item does not include the stand. You can check out our Hanging Chair Stands here.